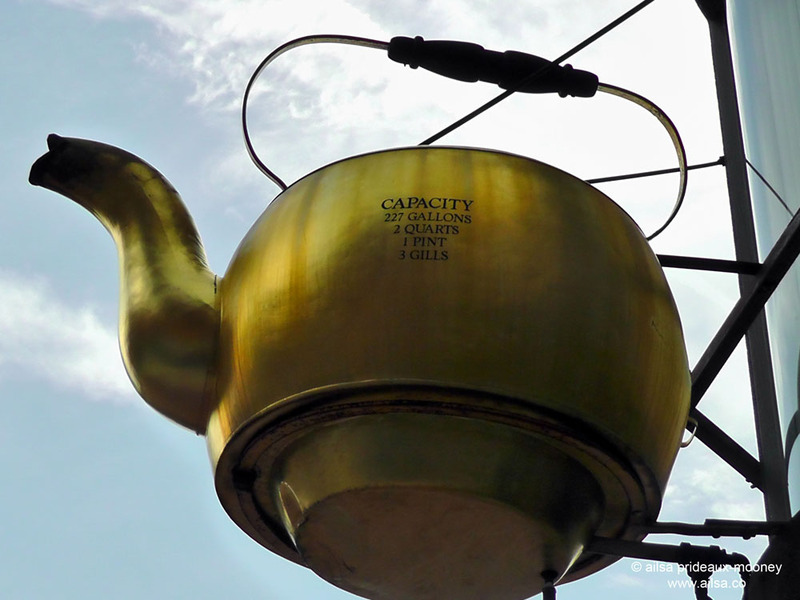 US Road Trip Day 9-11 – Huge Teapots,Tiny Churches and Farewells | Where's my backpack? We woke refreshed after a leisurely evening and a good night’s sleep at the motel in Oneida. We didn’t have far to travel today so we took our time on the road, stopping off at the very next exit, still within Oneida’s boundaries, to take in a surprising roadside attraction. Just off I-90 lies Cross Island Chapel, the self-proclaimed World’s Smallest Church. 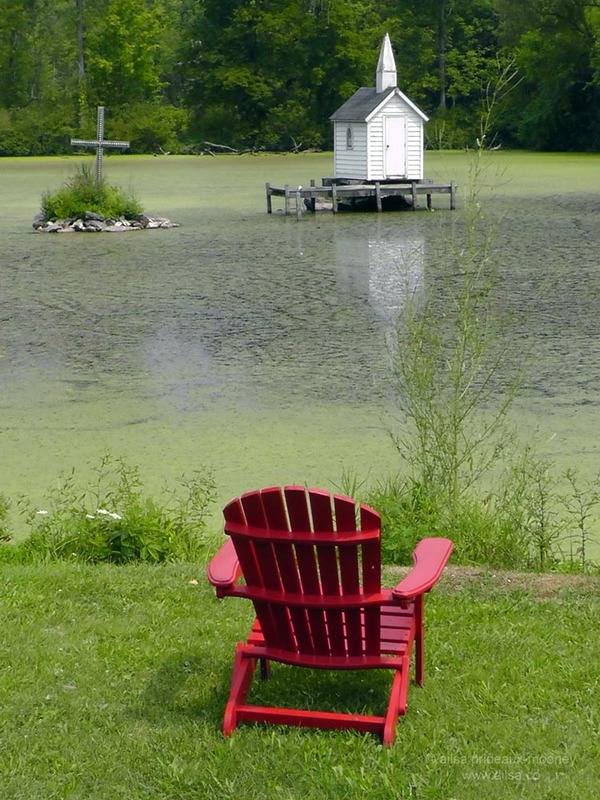 Measuring 51 inches by 81 inches, it seats just two people and is only accessible by boat because it sits on a platform in the middle of a pond. I couldn’t spot the Cross Island that its title alludes to – unless you count a couple of rocks sticking out of the pond. The chapel itself is built on a wooden platform over the rocks, and a cross that looks as if it is decorated with light bulbs adorns a nearby rocky outcrop. Weddings have actually been held here, with guests sitting in boats around the chapel as the bride and groom say their ‘I do’s’ within the confines of the teeny tiny place of worship. I’m sure it would make for a most intimate wedding. After our little detour, it took us no time at all to reach our destination; the small town of Hartford, Connecticut, where my friend’s cousin had kindly set aside her spare room for us to stay. The house was on the outskirts of town and deliciously remote, with a large, tree-enclosed backyard that lit up on summer evenings with dancing fireflies. 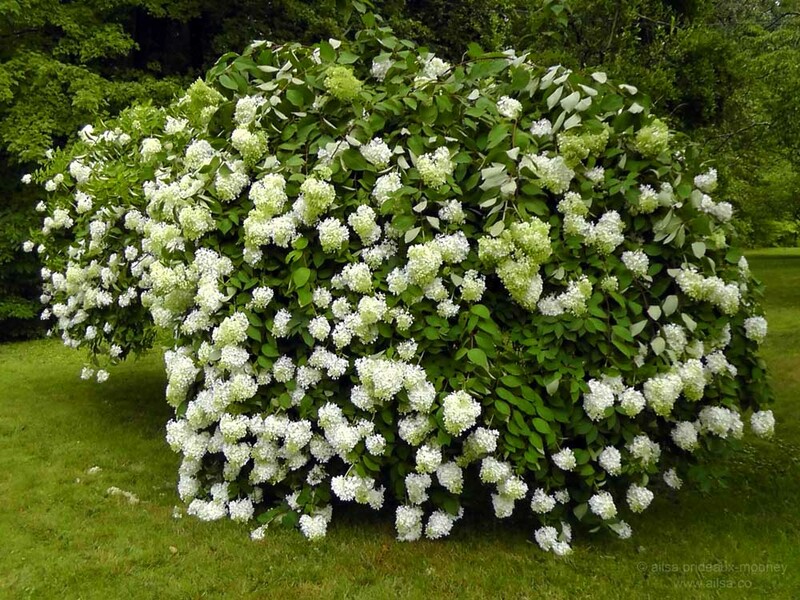 The front of the garden was dominated by a glorious vintage hydrangea in full bloom. My friend was now on a mission to find an apartment and get set up, so we set out for Boston the next morning to get the lay of the land. This was to be my only day in Boston before returning to the west coast, and much as I favour slow travel, I’m not above playing tourist if I’m short on time. We took a trolley tour with a wise-cracking tour guide named Vinnie and watched street performers in the marketplace. The most interesting sight that caught my eye on our whirlwind tour of Boston was The Steaming Kettle. It hangs on a wall at the intersection of Tremont and Court, where the Oriental Tea Company once had a shop. Cast in 1873, it still steams strong today, even though the Oriental Tea Company has long since been replaced by the ubiquitous Starbucks. We allowed ourselves to succumb to the ultimate tourist trap, eating at Cheers at Faneuil Hall. The original Cheers is the Bull & Finch on Beacon Street – its exterior featured in the TV show. The Cheers at Faneuil Hall is supposedly the actual set of the TV show complete with rigging and spotlights overhead. The food was average and the atmosphere was suitably cheery, but we didn’t linger long there because we were intent on finding the original Boston cream pie for dessert. The Omni Parker House is located along the Freedom Trail close to Quincy Market and is built on the site of the original Parker House where Boston cream pie originated in 1856. We went upstairs to Parker’s Bar, which is an elegant, dimly-lit space filled with dark mahogany panels and rich leather sofas. It exudes old world charm and was the perfect ending to our harried day. 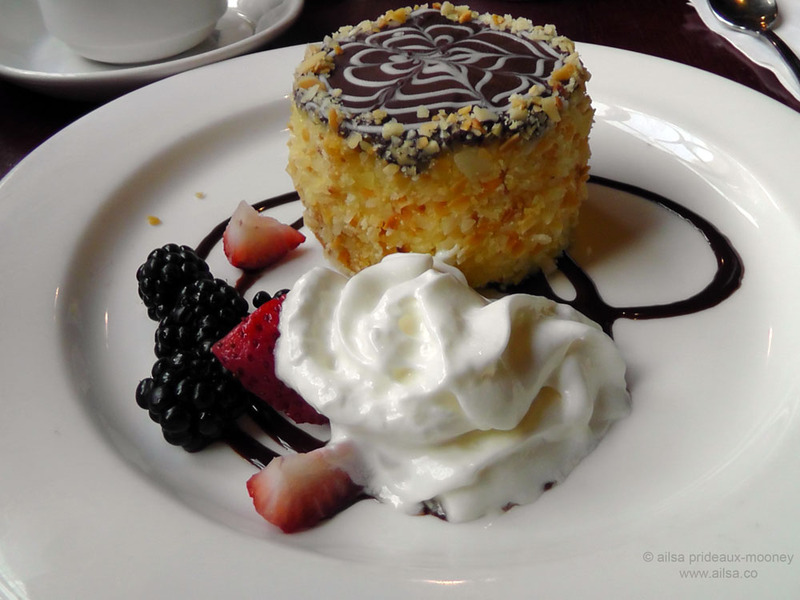 I am not usually a fan of Boston cream pie – I find the cream sickeningly sweet and the sponge unpalatably dry. The pie at Parker’s was only slightly sweet, allowing the creaminess of the custard to shine through, and the sponge was wonderfully moist. It was served with a small side of berries, and a splash of whipped cream. It was utterly delicious – the only surprise was that the cream was obviously from a can, but it was still the best Boston cream pie I’ve tasted. Back in Hartford, with my roadtrip drawing quickly to a close, we had one more day of exploring left. We spent it at a small lake where my friend’s uncle had a house. The day was warm and sunny, and the lake water was refreshingly welcome. As people and dogs splashed around in the cool water, I learned something new about Sprocket. He was afraid of the water, standing wistfully on the pier watching everyone else having fun, too afraid to go into to water himself. He wanted desperately to join in; I could tell by the way he got as close to the edge as he dared, at one point fitting all four of his paws into one square inch of pier, but despite everyone’s entreaties for him to take the plunge, he couldn’t quite muster up the courage. It was time to employ the distraction method. I grabbed a tennis ball – no doggy can resist a tennis ball – and waved it in front of his nose. He followed me and the ball back along the pier to the safety of the lake edge, down some stone steps and into the water. When he was standing in the water I let him have the ball, which he gleefully brought back to dry land. 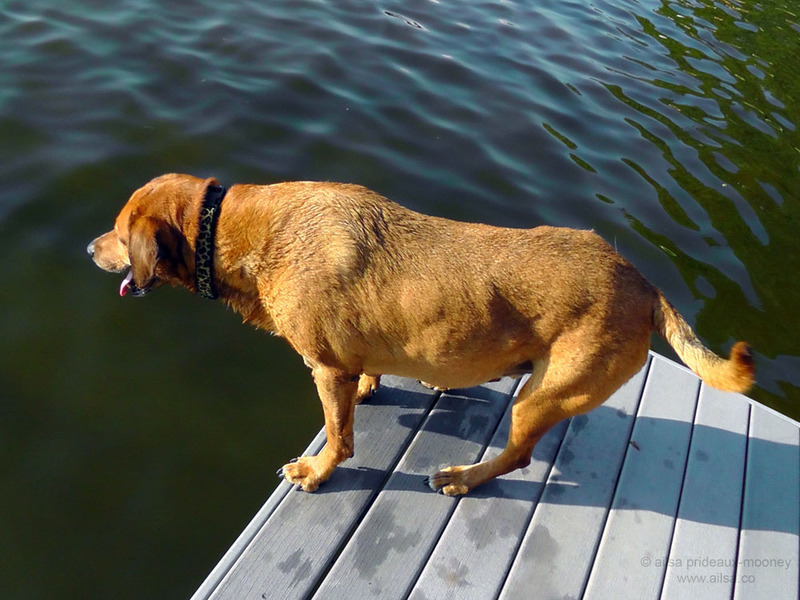 Once again I picked up the ball and led him down the steps, letting the ball gently bob in the water. He snapped at it and it bobbed a little further out, so he followed it and suddenly he was swimming. He swam just long enough to retrieve the ball and return back to the shore, where everyone congratulated him on his bravery. That was enough adventure for one day. 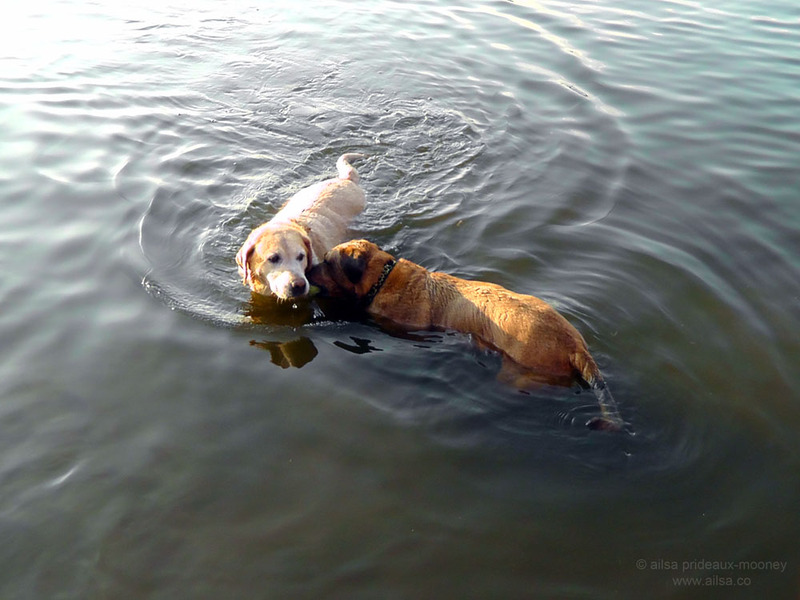 From there on out, Sprocket developed a routine for us: we would throw the ball into the water where a friendly golden retriever would grab it and bring it back to the shallows. Sprocket would wait in the shallow water to take the ball from his aquatically gifted friend and bring it back to us so we could throw it again. I admired his resourcefulness, what a clever boy! Oh how my heart ached to say goodbye to Sprocket and my friend, with whom I had shared so many adventures. We rose at dawn the following day to drive into Boston for my flight back to the west coast. I had a lump in my throat as I kissed the top of Sprocket’s head and breathed in his soft doggy scent. My friend and I hugged on the sidewalk outside of the airport and couldn’t find any words to express what we felt, so settled for a knowing look. It was the end of an awfully big adventure, but the beginning of another one, for I had received a phone call from another dear friend back in Seattle. She had been unable to join us on this trip due to work commitments, so very sensibly suggested that my road trip should simply continue, this time with her, and this time heading south to Utah. Anyone want to guess what my answer was? This entry was posted in Connecticut, Massachusetts, New York, Photography, Travel, United States and tagged photography, photos, pictures, postaday, road trip, travel, writing. Bookmark the permalink. I’m so pleased you said yes. You did say yes didn’t you? I really look forward to your road trips continuation. I will also miss having Sprocket along. Great story…. Hee hee, yes, pommepal, I said yes! Dear sweet Sprocket, I miss him dreadfully. I’ve loved your trip and I’ll really miss Sprocket! 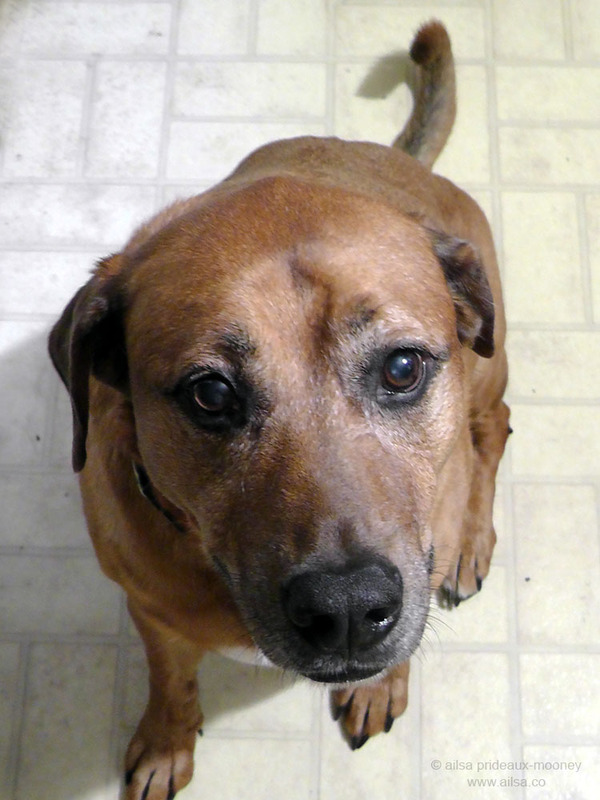 Oh Gilly, I left a huge piece of my heart behind when I said goodbye to that sweet doggy! On the road… I wish I was… Thanks for sharing! That pie was yummy Agness, and Sprocket is cuteness personified. He’s not my dog though, he’s my friend’s, I just got to travel across the country with him and fall in love with him too. I, too, will miss Sprocket and your adventures with him. Perhaps your Seattle friend has a dog who would like to tag along? Hee hee, she actually has two hysterically funny dogs who I love dearly, but they have both decided to stay home and keep her husband company whilst we go gallivanting around the southwest! I would love to taste original Boston cream pie! It looks so delicious! It is delicious, vyvacious. I hope you get to taste the original pie for yourself someday! 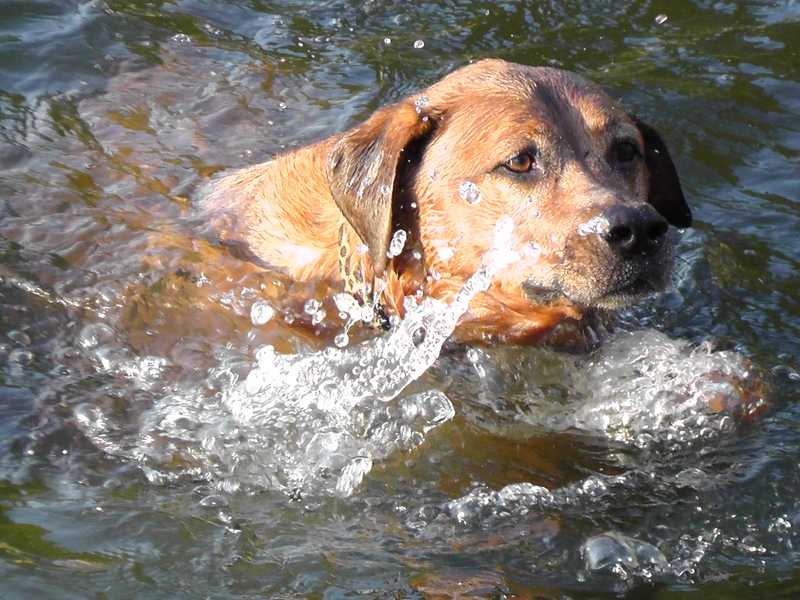 I love the look in Sprocket’s eyes when he is swimming. It’s just love and great gratitude to you helping him to get in to the water but not having to jump from the jetty. Aren’t dogs just wonderful? And now to Utah, how exciting! Be sure to wave as you drive past the home I left just last year! I look forward to reading more, and also, heading out this weekend to find that Boston cream pie. Oh boy, what a stunning part of the world you used to live in, ididitforjohnny. Yes, find that Boston cream pie and think of me as you savour each tasty bite! What a lovely ending to a great story. Looks like Sprocket feels the same way about you! Grin. I think it safe to say we had more than a few bonding moments along the way! Sorry this trip is over but another will begin?! Great! It took about, let me see, thirty seconds? So exciting, this is such a vast and crazily beautiful country. These are beautiful pictures! Looks like so much fun! What an adorable and brave dog is Sprocket. 🙂 What an amazing trip the three of you had. I’ve so enjoyed following you, Ailsa. Yes, he’s such a brave boy, and a total sweetie. We’ve had the most incredible adventures and I’ve enjoyed having you along for the journey, ad! Stay tuned for more adventures! A beach chair, a tasty treat and dogs! What more can we ask for…. lovely. Oooohhh I’m looking forward to more! Bye Sprocket! Thank you so much for taking us along, Ailsa! Sprocket is such a sweetie, will miss him. I have enjoyed this roadtrip and look forward to your next adventure. Brave Sprocket! I thought the world’s smallest church in outside Niagara Falls ???? Living Waters Wayside Chapel, the look very similar – first I thought it was the same one. Anyhow they are very small. 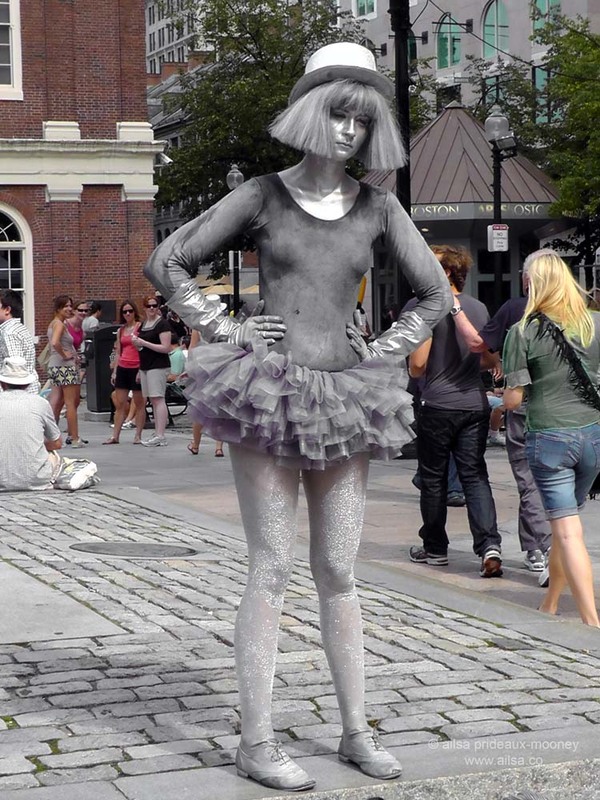 Boston is a fantastic city – great food … great shopping and all that water. At Quincy Market I had my first sandwich wrap and that was over 20 years ago. Love Beacon Hill – what a place – with the old street lamps – wouldn’t mind one of those houses. Had a very nice and rich male acquaintance in Boston at one time. Loved the park with the Frog Pond. What amazing trip you have been on – how come you have to say goodbye to Sprocket ??? The swimming photo of Sprocket – are so lovely. Are you now going on your own ???? Ahh viveka, Sprocket is not my doggy and I am not his human. I was just helping my friend and Sprocket move across the country safely. They are going to be living over there now, but I am returning to the west coast and joining up with another friend to explore a bit more of the country. Oh, yes, Living Waters Wayside Chapel is no longer the smallest church in the world – it measures an enormous 120 inches by 120 inches so it quite a bit bigger than this one. It looks quite similar though! Oh, I thought he was your dog .. must have missed that. He was so happy there in the water – understand that it was hard to say goodbye after an adventure like that. I looking forward to the next chapter of your journey. Okay … for a while I thought it was the same church .. what I have the moved Living Waters Chapel – from the road siunderstand de now. What a fun trip! Love the smallest church! Love the hydrangeas, the dogs swimming, and that delicious Boston creme pie!! looking forward to your next adventure… of course i knew you will say ‘yes’.. Thanks for the reblog, Sherry! Were you not thinking of all of us, Ailsa, when you didn’t poochnap Sprocket? That face! We’ll miss him as well. Safe travels to you. Oh Sid, I was sorely tempted, trust me, but my friend would never forgive me! Am just catching up on comments now, Ruth – have I posted enough pics of Utah yet? What an insanely beautiful state. Love you Sprocket……bye……hope we meet again! Me too, oh I hope so! Awwww Sprocket is such a handsome boy! I know, he stole my heart, ioanna! Sprocket looks like a lot of fun! What a great trip, I’ve enjoyed your adventures and am looking forward to what the next one will bring! I’m finally catching up on your adventures, sounds like you’ve had a great trip s far. However, having grown up in CT, and being able to see the skyline from my mothers house in Glastonbury, I would hardly call Hartford a “small town.” Maybe not NYC big, but it’s a big enough city for me.